Now that summer is around the corner, diners are craving lighter meals and eats that are bikini-friendly. Bassel Osman, co-owner of Pita Jungle (a restaurant that dishes up some of the Valley’s most nutritious fare at its local outposts), on healthy at-home cooking. How would you describe the cuisine at Pita Jungle? The Pita Jungle concept is based on offering a healthful and natural cuisine abounding with vegetarian and vegan options, crafted within the principles of the Mediterranean diet. The menu flourishes with items that seek to balance greens, grains, legumes, low fat meats and fruits. We are preparing our dishes daily from scratch with only the freshest ingredients. Delivering a high-quality nutritious product at a fair price is our mission. Why do you think there has been much more interest lately in healthy eating? People are generally more concerned about what they put in their bodies. A lot of research has been done lately and is easily available on the web that shows a correlation between a healthy diet and exercise with fewer health problems and longevity. Several studies published last year looked especially at the benefits of the Mediterranean diet in this regard and found that people following the Mediterranean diet seemed to be healthier overall. I am therefore not astonished that people are changing their eating habits. Where does the inspiration stem from for your culinary creations? Applying the principles of the Mediterranean diet of balancing greens, grains, legumes, low-fat meats, fruits and EVOO with locally sourced ingredients and inspired by world cuisine. Standing in front of a blank canvas “pan” and turning a mountain of fresh ingredients into a crunchy meal associated with the smells and sounds of the kitchen is very inspiring for me. Seeing a smile on a customer’s face when eating and kid’s faces while exploring a new menu item is the ultimate recognition. What are some tips for home cooks in regards to cooking healthier? I think minimum processing is very important, trying to buy fresh ingredients and starting a meal from scratch while using good fats such as EVOO will help home cooks eat healthier. 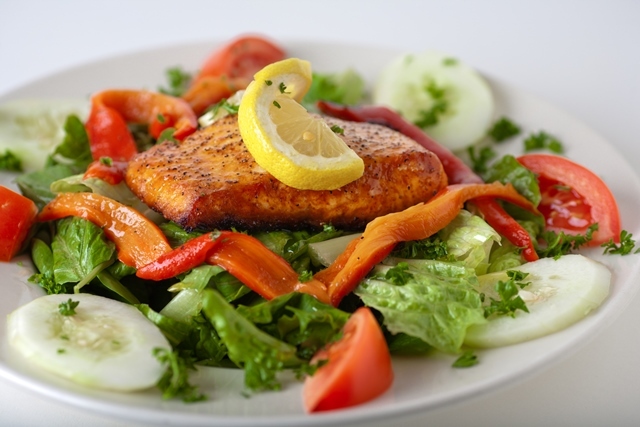 Try to stay away from processed as well as deep-fried foods will help the entire family eat healthier and feel better. How do you get kids to eat veggies and other healthy items? If you want your kids to eat more veggies and fruits you have to show them healthy eating habits first. Then, once children grow up, they want to make their own choices – give them this choice! Let them choose between carrots and broccoli for example – and have them dip it in hummus or any other healthy dipping sauce. At Pita Jungle, we want to teach our little customers that eating healthy can be fun and delicious. We have created a kid’s menu that allows children to make their own choices. They can choose from a variety of grains and carbs, proteins, vegetables and fruits and create their own delicious meal. Another way to make them eat better is to let them help in the kitchen. They will be more likely to try new foods if they have prepared them, and at the same time, you can educate them about healthy eating in a fun, hands-on way. What healthy ingredients should at-home chefs try (perhaps items they might not have heard of)? Of course quinoa comes to my mind as well as kale and heirloom cauliflower. Other ingredients such as truffle oil, coarse sea salt add flavor to many ingredients. Za’atar is ubiquitous in the Middle Eastern cuisine and can be used to add a savory kick to many foods.